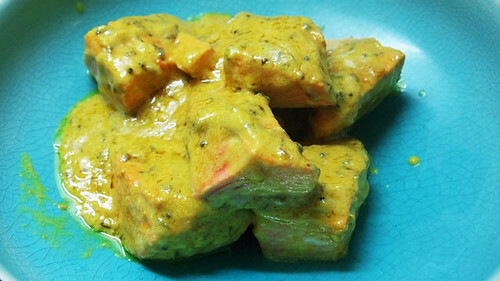 Fish isn’t usually the first thing that you’d think of when you think of curry. Not most people anyhow. Chicken, lamb and prawns (not to mention cheese/paneer, spinach, okra and potatoes) tend to spring spicily to mind instead. At least for this South Asian food lover. Which, when you think about the size of the subcontinent – and its 6000 miles plus of coastline, not to mention the mighty rivers – is ridiculous. And anyone who has travelled in the area will know that people there cook fish as well as they do everything else. Sure, you may not always find the same sort of fish and seafood as back home, but the techniques and flavours translate well. Particularly when it comes to oily, strong flavoured fish. Like salmon. This dish is one I’d use for anyone who isn’t sure about fish curries, although it’s not really a curry, more a saucy fish. Wild salmon has a good meaty edge to it and the flesh has a bit of bite. It’s the game of the fish world, a natural match for aromatic spices. It’s a quicky too, resting time aside, it only takes about 15 minutes of actual work. And it looks so pretty – and I’m a real sucker for a dishy fish. All in all, one of those lazy dishes to serve with a breezy refrain of: “Oh I just threw this together at the last minute” and then sit back, enjoying the expressions of disbelief. You could use any oily fish here, but I think the wild salmon works well. And please, please use sustainably sourced fish. Make sure at the very least it’s MSC approved. Even treat the farmed stuff with caution. To read more about why you should use sustainable fish, check out this great post from Fernandez and Leluu. Rub with some cayenne, tumeric and seasalt cover and leave to rest in the fridge for a few hours. You can get away with just thirty mins if you’re rushed. Heat oil in a frying pan (I use a non stick one). 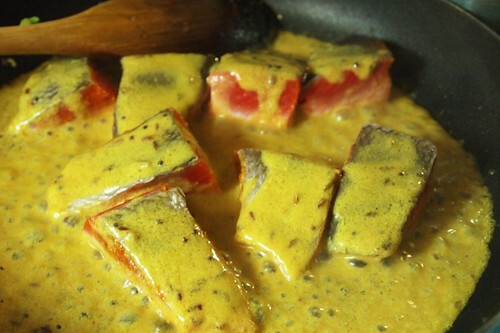 When hot and starting to shimmer add the mustard, cumin, chilli and fennel seeds. When the mustard seeds start to pop pour in the mustard paste and stir. When it simmers place the fish in skin side down, cover a little with the sauce and simmer for 5 minutes, turning abut half way through. Serve with rice and some veg. I wish we saw more fish curries – South Indian places are your best bet, well those that aren’t veggie anyway! Like so many foodie hopes and dreams that I have, the stand-off between punter and restaurateur stops them becoming reality. Are there enough punters willing to switch away from their bog-standard choice of ruby? Are restaurateurs brave enough to introduce more fish dishes at the risk of losing money? Oh, I love me a nice fish curry! @Mr Noodles – I agree, i love a good fish curry, but the fish section at most South Asian restaurants is pitifully short, and 90% prawn. But you are right about the standoff, it needs work from both sides. @Carla – you and me both – yum! If you can find it, you should try this dish with mustard oil. Everything in West Bengal is cooked in it. It has a distinctive flavour that I find slightly alluring. Dish looks damn tasty looking..
@Mzungu – Oooh, i’ve seen some mustard oil in some of the local grocery shops – must get me some to try out. Thanks for the pointer.